Did you imagine Star Wars characters and vehicles all around you when you were a kid? Well, Thomas Dagg took his love of Star Wars and combined it with the mundane moments in real-life and the results are amazing. 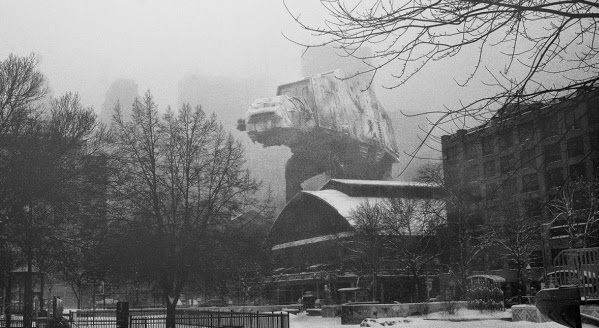 Toronto-based photographer spent years compositing everything from Yoda to AT-ATs into black-and-white photos of every day life. When Esquire interviewed Dagg, he said that the photos are "very much an homage to my childhood, not just putting popular culture into photographs." You can see more at his personal site Thomas Dagg's Blog. Which is your favorite photo? Did you imagine Star Wars coming to life? What did you imagine? So cool. I like the one with Yoda best. Star Destroyer overhead was really cool.